Political Party Jammu & Kashmir National Conference. Education M.B.B.S From S.M.S. Medical College, Jaipur, Rajasthan. 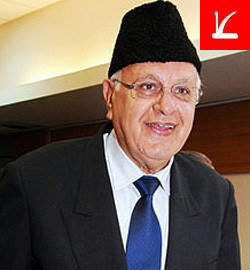 Farooq Abdullah is a famous political leader hailing from Jammu and Kashmir.. He was elected as the President of National Conference in August 1981.He served as the Chief Minister of Jammu and Kashmir many times since 1982. In 2002, he was elected as a member of Rajya Sabha. He was a Cabinet Minister in the UPA government. His son, Omar Abdullah is the present Chief Minister of Jammu and Kashmir. Farooq Abdullah is also the President of Jammu & Kashmir National Conference, a state political party that was founded back in 1937. Farooq Abdullah was born on 21 October 1937, in Kashmir's Soura region. His father, Sheikh Abdullah, was a doctor of medicine. He was also one of the exponents of anti-feudal rule in Kashmir and contributed towards ending the Dogra regime during 1930s and 1940s. Farooq did his schooling from C.M.S Tryndale Biscoe School in Srinagar, following which he went on to pursue his academic career in medicine. He is an MBBS degree holder from the Sawai Man Singh Medical College in Jaipur. In 1968, Farooq got married to a British lady, Mollie. How did Farooq Abdullah enter politics? Farooq Abdullah made his debut in politics quite late in his life. Being a social worker by profession, Farooq hadn't tried his hands at politics until August, 1981 when he was appointed as the President of the National Conference party. Despite the fact that the political landscape of Kashmir was very much unknown to him, he secured the top position in the party since his father Sheikh Abdullah was the National Conference Party leader. Within a year of his father's demise in 1982, his political responsibilities witnessed a major leap as he became the Chief Minister of the state for the first time. Farooq was appointed as the President of Jammu & Kashmir National Conference party in 1981. In 1982, he became the Member of Jammu & Kashmir Legislative Assembly and handled the portfolio of the Health Minister of J&K. In 1983, Farooq became the Chief Minister of Jammu & Kashmir and was appointed as the member of J&K Legislative Assembly for the second term. From 1983-87, he served the state in his capacity as a Chief Minister. Farooq continued his stint as the J&K Chief Minister from 1987-90. In 1996, Farooq was sworn in as the Chief Minister of the state for the fifth time. Between 1996 and 2002, he doled out his responsibilities as the state's Chief Minister and the member of Jammu & Kashmir Legislative Assembly. In 2002, Farooq was elected to the Rajya Sabha from Jammu and Kashmir. He was again appointed as the member of J&K Legislative Assembly for the fifth term, but he stayed in power only for three months from Dec 2008 to Feb 2009. Farooq was re-elected to the Rajya Sabha for a second term in Feb 2009. In the same year, he was re-elected to the 15th Lok Sabha, and was also appointed as the President of Jammu and Kashmir National Conference Party. On 31 May 2009, he became the Union Cabinet Minister for New and Renewable Energy. Simultaneously, he held his post as the President of the National Conference Party. Since Oct 2012, he has remained the Union Cabinet Minister for New and Renewable Energy. Farooq Abdullah's government in Kashmir came under harsh criticism in late 1980s for not being able to ebb the rise in militancy in the state. It was during this tenure that Kashmir witnessed sharp rise in crime. His government was dismissed and Kashmir was brought under the President rule. As a Renewable Energy Minister, he has been proactively drawing the road-map for successful implementation of the Jawaharlal Nehru National Solar Mission, which was launched by the Indian government. He has also been involved in getting international investors to invest in the Renewable Energy sector of India. Farooq Abdullah has shown visible efforts towards making India an energy-efficient country. His ministry has taken up the challenge of setting up the world's largest solar power project in Rajasthan, having a total generation capacity of 4,000 MW. Farooq Abdullah was honoured with the B.C. Roy National Award in 1999, for being a doctor serving a larger political and social cause. He is also the recipient of several honoray degrees. The Aligarh Muslim University bestowed upon him the D.Litt. (Honoris causa). He has also received the Degree of Letters (Honoris causa) from the Pondicherry University.